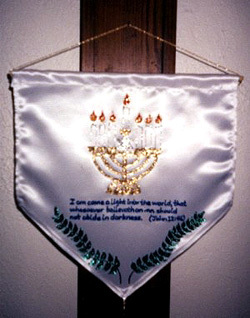 A selection of handmade, handpainted banners celebrating the restoration of the Holy Land of Israel, where the Lord has said He will dwell forever, and where Yashua, the Messiah will return and reign King of Kings. 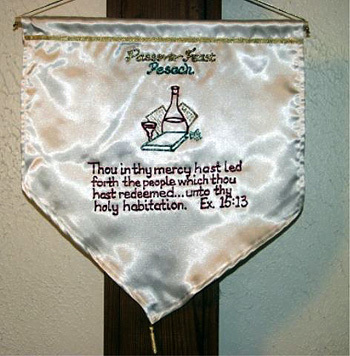 Each banner is an original signed artwork and no two designs are alike, except for chosen Scripture verse. 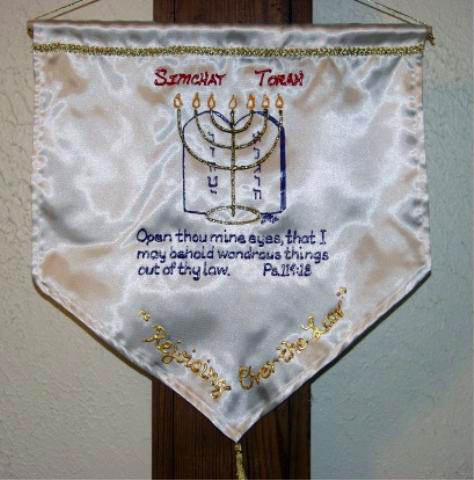 Order custom-made banners for your home or congregation. Banner designs may also be purchased as custom prints suitable for framing (email Debbie below). 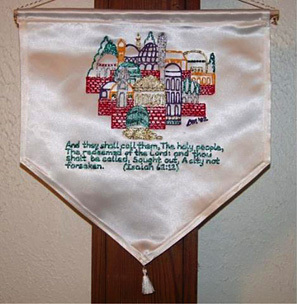 Jerusalem - Colorful scene of Jerusalem with golden steps to the city gate, above hand-lettered Scripture, handpainted on heavy white satin, ready to hang with white and gold trim, tassle and hang cord. Choose Isaiah 62:12 (Order Number B01-I); or Jeremiah 3:17 (Order Number B01-J)Approx. size 14 in. 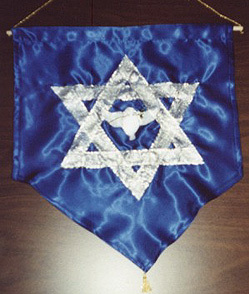 x 15 1/2 in. including 1 1/2 in. tassle. $30.00 (+ shipping-see Order Form). 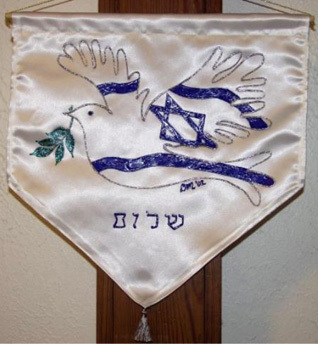 Pray For Peace - Star of David of wide, sparkling silver ribbon, enclosing a white satin dove carrying a handsewn olive branch with beaded leaves, handcrafted, on royal blue satin, ready to hang with gold trim, tassle and hang cord. 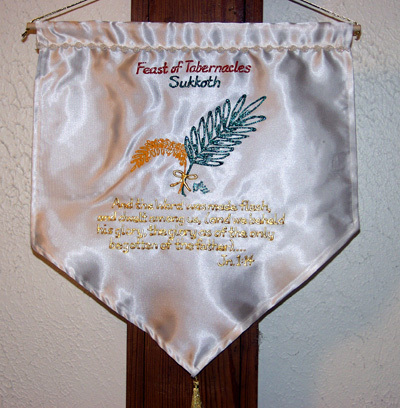 (No Scripture on this banner.) Approx. size 14 in. x 15 1/2 in. including 1 1/2 in. tassle. Order Number B02 $30.00 (+ shipping-see Order Form). 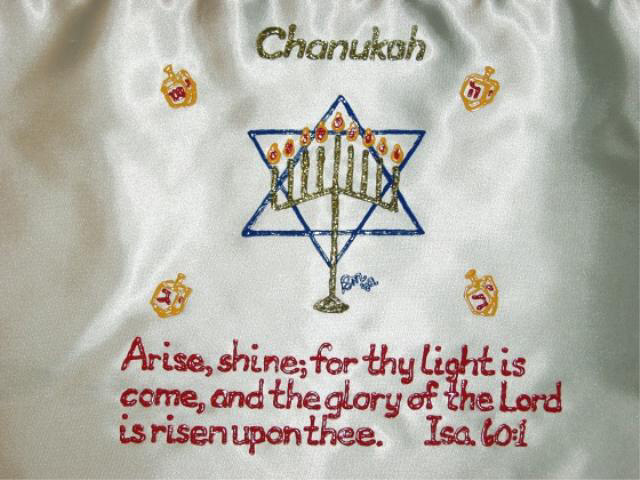 Light of the World - Sparkling golden candelabra with silver star of David and accents, and lighted candles above hand-lettered Scripture; decorated with glittering green vines. 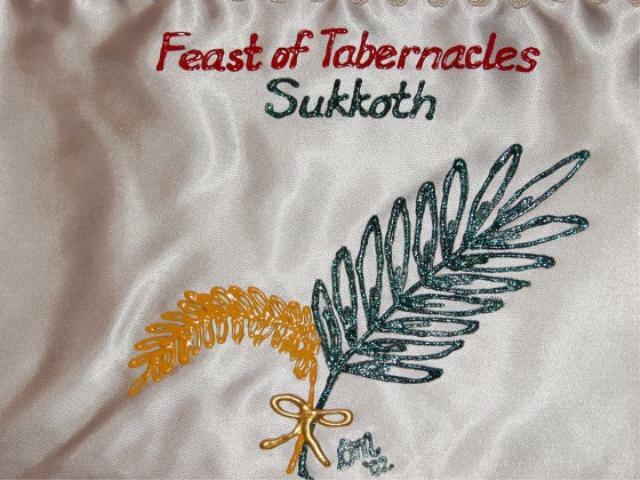 Handpainted on heavy white satin, ready to hang with golden tassle and hang cord. Choose John 12:46 (Order Number B03-J) or Isaiah 60:1 (Order Number B03-I);Approx. size 14 in. x 15 1/2 in. including 1 1/2 in. tassle. $30.00 (+ shipping-see Order Form). 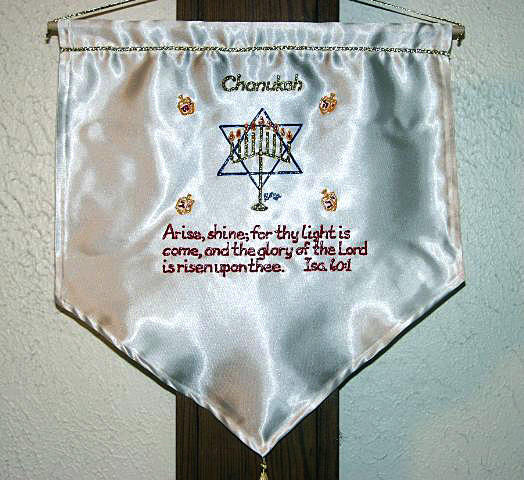 Four banners above sold as a set are specially priced at $100.00 + shipping, SAVE 20%! My Banner Shop has been visited times.